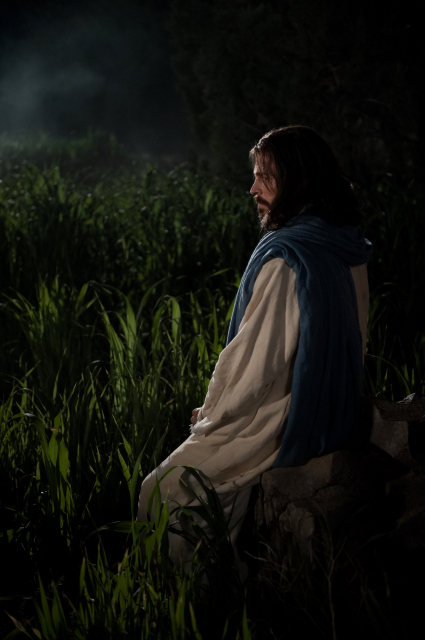 When Jesus had spoken these words, he went forth with his disciples over the brook Cedron [or Kidron, to the east of Jerusalem] unto a place where was a garden which was named Gethsemane [or garden of olives], into the which he entered. And when he was at the place, he said unto them, “Pray that ye enter not into temptation.” And he taketh with him Peter and James and John, the two sons of Zebedee, and began to be sorrowful, sore amazed, and very heavy. And he went a little further from them, about a stone’s cast, and kneeled down, and fell on his face on the ground, and prayed that, if it were possible, the hour might pass from him. And when he returned and he found them asleep again—for their eyes were heavy, neither wist they what to answer him. And he left them, and went away again, and prayed the third time, saying the same words. Then he cometh the third time and saith unto them, “Sleep on now, and take your rest. Behold, it is enough, the hour is at hand, and the Son of man is betrayed into the hands of sinners.